The bestseller LIPO 100 is now available in powder form in two flavours. The beverage powder contains a wide range of plant extracts which do not dissolve completely in water. Therefore, minimal residues may remain in the shaker. However, this does not impact the effect of LIPO 100 Powder. The bestseller LIPO 100 is now available in powder form in two flavours. Taurine and glucuronlactone that are well-known from energy drinks were added to the new beverage powder. Since the LIPO 100 Powder is consumed as a beverage the nutrients are provided to your body much quicker than with capsules. Also, the powder is an ideal alternative for people who are having problems swallowing capsules or who don´t like pills in general. Worth knowing: What are the effects of the ingredients of LIPO 100 Powder? Popular plant extracts: For example ginkgo biloba, chili, green tea extract which deliver vitamin-like substances such as polyphenols (Epigallocatechin gallate) and piperine. LIPO 100 Powder contains the patented form Bioperine®. Caffeine is known for its stimulating effect which means it supports your fat burner training ideally as it can help boosting endurance performance. Furthermore, it can improve concentration during lengthy and exhausting workouts. In combination with the B vitamins it helps delaying fatigue caused by a strenuous workout. Thus, a scheduled fat burner training is easier to manage so that goals can be reached faster. Chromium is a trace element. It is important for people on a low-calory or low-carb diet, as it helps to maintain normal blood sugar levels. A strict diet or an undersupply of chromium can induce hypoglycemia. That´s why it is important to plan the carbohydrate intake around your fat burner training properly. Choline assists normal fat and energy metabolism. As well as DMAE, it is part of the nervous system and contributes to normal liver function. The liver is the central metabolic organ, where important build-up processes take place. L-tyrosine is an amino acid. It is needed for the build-up of body proteins, together with iodine which is critical for a normal thyroid function and the hormone production. The thyroid plays an important role in a lot of metabolic processes e.g. protein synthesis, fat metabolism etc. L-carnitine is a vitamin-like nutrient which occurs in energy and fat metabolism. LIPO 100 Powder contains Carnipure™, which is known to be the most valuable L-carnitine on the market. 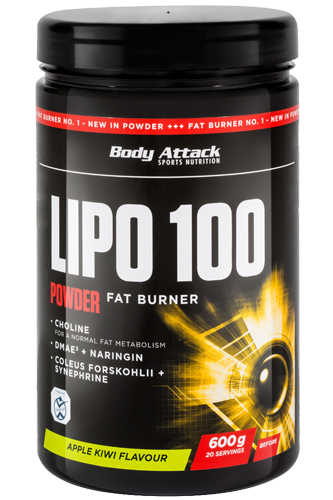 Which products can Body Attack LIPO 100 Powder be combined best with? In an athletic weight-reduction phase, along with Body Attack Power Protein 90 to preserve muscle mass. In combination with BCAA Capsules, containing BCAA which is very popular with bodybuilders, as the muscles contain BCAA. As a part of a low-calory nutrition to support the weight regulation in combination with the Body Attack Diet Shake.